The new Nokian Powerproof summer tyre masters all the forms of summer with an enjoyable balance. The extremely stable handling and logical steering offer peace of mind for both high-speed lane changes and sudden braking. Nokian Powerproof is the prime example of Nokian Tyres’ entirely new generation of summer tyres for the Central European market. The Nokian Powerproof exudes an air of quality and ease of driving, and it belongs in the top tier of passenger car tyres: the UHP category. Its extensive size selection comprises 51 products from 17 to 20 inches, with speed ratings of W (270 km/h) and Y (300 km/h). The new products will be available to consumers in the spring of 2019. The Dual Zone Safety concept developed by the world’s northernmost tyre manufacturer ensures that the contact surface of the Nokian Powerproof remains precise and exact, on rain-slick motorways and sun-scorched boulevards alike. The F1 World Champion Mika Häkkinen also contributed his expertise to the testing of this premium product with excellent handling characteristics. The new, strong structure ensures the durability of this summer tyre which is designed for fast driving. The Tire Performance Mark from the independent TÜV SÜD testing organisation communicates versatile and comprehensive performance. According to Nokian Tyres’ consumer survey, European drivers especially value good wet grip and driving stability in their summer tyres. Owners of sporty vehicles especially look for safety under extreme conditions. - Safety is always at the core of our product development philosophy. The unique Dual Zone Safety concept ensures balanced road contact for the new Nokian Powerproof. The driver can feel how the tyre grips, adapts to surface roughness and immediately reacts to steering especially on wet and dry roads, which is an absolute requirement for safety during sudden evasions, for example, says Jarno Röytiö, Development Manager at Nokian Tyres. The Wet Safety Zone on the tyre’s inside maximises safety on wet roads by optimising grip while preserving logical and stable handling. The Trapezoidal Flow Grooves divide the centre rib and the rib closest to the inner shoulder. This sweeping, winding design of the groove bottoms allows for effective aquaplaning prevention by storing water and accelerating the removal of water from between the tyre and the road surface. The seamless cooperation of the inner shoulder’s tread blocks and grooves also supports agile aquaplaning resistance. The groove ends formed in the tread blocks have been spread out and their sides have a horn-like indentation. These Swoop Grooves further facilitate the removal of water. The wide and polished main grooves also allow for effectively storing water, which improves safety in rainy weather. Three wide and sturdy main ribs dominate the appearance of the modern summer tyre. The shoulder area design of the Nokian Powerproof, delivering much-needed steering precision at high speeds, is full and sleek. The new sturdy and durable structure, developed especially for fast driving, offers additional stability from the first moments of spring to the hot asphalt of late summer. - The new tread pattern and structure allowed us to create a contact pattern for the tyre that provides logical and predictable road feel and quick steering feedback in both rain and shine. The contact is steadier and more dynamic than before, which means excellent grip and even better durability on high-speed motorways and poorly maintained alpine routes alike, Development Manager Röytiö explains. In addition to comprehensive laboratory testing and indoor testing, the demanding development work also utilised computer modelling and high-speed cameras. 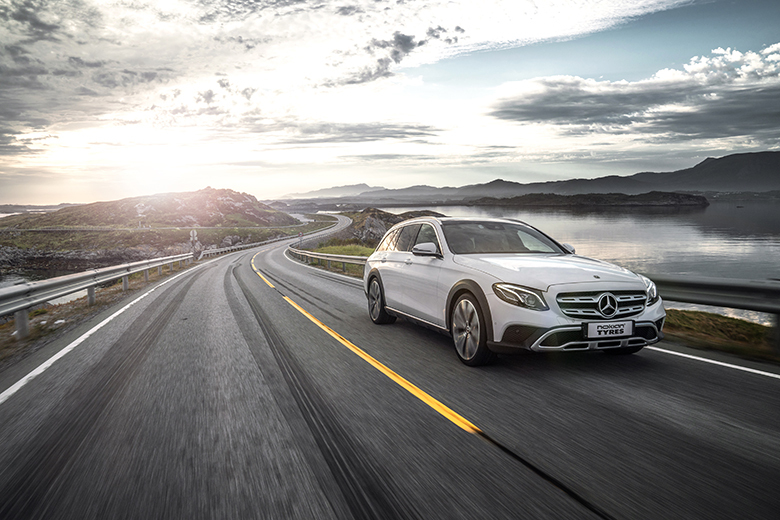 Field testing under real road conditions took place in Germany, the Czech Republic, Spain, Portugal and Finland. The durability of the new product was fine-tuned on the basis of a tough test programme under the hot Spanish sun. High speed test tracks in Germany and Spain were used to refine the characteristics for extreme conditions at high speeds. - The new Nokian Powerproof gives me extremely fantastic steering feedback. That is exactly the feature you want in quality tyres. When the tyre gives you confidence in driving, it also gives you safety, says Mika Häkkinen, a professional of speed and two-time Formula 1 World Champion, who provided his experience and insight into the testing and development. Fluent, predictable road feel is an absolute requirement for enjoyable driving. The new Nokian Powerproof can safely, comfortably and silently master different road surfaces. The hemispherical indentations, reminiscent of a golf ball pattern, on the walls of the longitudinal ribs provide additional driving comfort. The Silent Groove Design innovation reduces the interior noise and external rolling noise of the vehicle. The bead area uses a new Clinch rubber compound that improves comfort and fuel efficiency, making the tyre roll silently and smoothly. In addition to the tread depth indicator (DSI – Driving Safety Indicator), which is patented by Nokian Tyres, this champion of variable road conditions also has an aquaplaning indicator on its tread. Its droplet symbol disappears when less than four millimetres of tread are remaining, indicating an increased risk of aquaplaning. The information area allows for recording the correct inflation pressure and installation location when changing the tyres. Dual Zone Safety. Stability and precise handling on dry and wet roads. The Power Zone on the outer shoulder improves handling, while the Wet Safety Zone on the inner shoulder improves grip and aquaplaning resistance on wet roads. Power Zone. Precise handling. The new durable structure, streamlined tread pattern, sturdy tread blocks and the Slope Groove Design with sloped groove edges make driving on dry asphalt precise and controlled. Wet Safety Zone Controlled grip on wet roads. The Trapezoidal Flow Grooves divide the centre rib and the rib closest to the inner shoulder. The sweeping, winding design of the groove bottoms allows for effective aquaplaning prevention by storing water and accelerating the removal of water from between the tyre and the road surface. The Swoop Grooves also support agile aquaplaning resistance. The groove ends formed in the inner tread blocks have been spread out and their sides have a horn-like indentation to accelerate the removal of water. Dynamic Grip compound. Reliable grip on wet and dry roads. The functional molecule chains and polymers form a dense and flexible mesh-like structure that ensures reliable grip even at high speeds. The multi-layered structure also reduces rolling resistance. Silent Groove Design. More driving comfort. The hemispherical indentations, reminiscent of a golf ball pattern, on the walls of the longitudinal ribs provide additional driving comfort. The innovation reduces the interior noise and external rolling noise of the vehicle. The design also reduces air resistance and cools the surface of the tyre, in turn improving wear resistance. Special Clinch rubber compound. Lower noise level and rolling resistance. The rubber compound presses flexibly against the wheel flange, providing the bead area with more durability. The innovation also effectively minimises the interior noise and rolling resistance. Polished grooves. Stylish and functional: water flows easily and efficiently off the slick and polished main grooves.